The real diffusion of laparoscopy for the treatment of colorectal diseases in Italy is largely unknown. 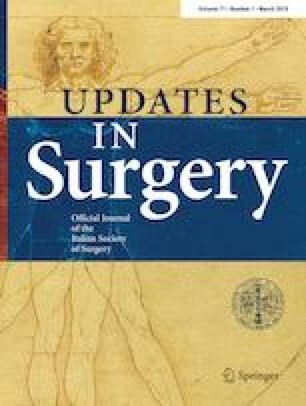 The main purpose of the present study is to investigate among surgeons dedicated to minimally invasive surgery, the volume of laparoscopic colorectal procedures, the type of operation performed in comparison to traditional approach, the indication for surgery (benign and malignant) and to evaluate the different types of technologies used. A structured questionnaire was developed in collaboration with an international market research institute and the survey was published online; invitation to participate to the survey was issued among the members of the Italian Society of Endoscopic Surgery (SICE). 211 surgeons working in 57 surgical departments in Italy fulfilled and answered the online survey. A total of 6357 colorectal procedures were recorded during the year 2015 of which 4104 (64.1%) were performed using a minimally invasive approach. Colon and rectal cancer were the most common indications for laparoscopic approach (83.1%). Left colectomy was the operation most commonly performed (41.8%), while rectal resection accounted for 23.5% of the cases. Overall conversion rate was 5.9% (242/4104). Full HD standard technology was available and routinely used in all the responders’ centers. The proportion of colorectal resections that are carried out laparoscopically in dedicated centers has now reached valuable levels with a low conversion rate. The article is part of topical collection on mini-invasive colorectal surgery. The members of SICE colorectal collaborative group have given in the Acknowledgements section. The online version of this article ( https://doi.org/10.1007/s13304-018-0606-5) contains supplementary material, which is available to authorized users. The following surgeons and affiliated centres participated in the SICE colorectal collaborative group(surgeon listed alphabetically by last name) Marco Amisano MD, Department of Surgery, Ospedale di Casale Monferrato, Casale Monferrato (TO). Gabriele Anania MD, Department of Surgery, University Hospital, Ferrara. Dario Andreone MD, Department of Surgery, AOU San Luigi Gonzaga, Orbassano (TO). Giovanni Angelone MD, Department of Surgery, Ospedale S. Maria della Pietà, Casoria (NA). Gianandrea Baldazzi MD, Department of Surgery, Policlinico Abano Terme, (PD). Carlo Bergamini MD, Department of Surgery, Ospedale Careggi, Firenze. Francesco Giuseppe Biondo MD, (Department of Surgery, Azienda Ospedaliera Moscati, Avellino. luigi Boni MD, Department of Surgery, Fondazione IRCCS Ospedale Maggiore Policlinico, University of Milan. Alberto Brolese MD, Department of Surgery, Ospedale Sanata Chiara, Trento. Riccardo Brachet Contul MD, Department of Surgery, Ospedale Umberto Parini, Aosta. Roberto Campagnacci MD, Department of Surgery, Ospedale Carlo Urbani, Jesi (AN). Fabio Campanile MD, Department of Surgery , Ospedale di Civita Castellana, (VT). Angelo Cavicchi MD, Department of Surgery, Ospedale Civile di Senigallia, (AN).Massimo Carlini MD, Department of Surgery, S. Eugenio Hospital, Roma, . Bruno Cola MD, Department of Surgery Policlinico S.Orsola-Malpighi, Bologna. Maurizio Cesari MD, Department of Surgery, Ospedale Città di Castello, (PG). Luca Covotta MD, Department of Surgery, private Hospital Villa Maria, Avellino. Pietro Cumbo MD, Department of Surgery, ASL TO 5, Chieri (TO).Nicolò De Manzini MD, Department of Surgery, University Hospital, Trieste. Francesco de Marchi, Department of Surgery, Ospedale San Bartolo, VicenzaPaolo de Paolis MD, Department of Surgery, Humanitas Gradenigo, Torino.Giorgio Ercolani MD, Department of Surgery, Ospedale di Forlì, AUSL Romagna, Forlì. Manes Fernando MD, Department of Surgery, Ospedale Mazzoni, Ascoli Piceno. Alessandro Ferrero MD, Department of Surgery, Ospedale Mauriziano Umberto I, Torino. Gianfranco Francioni MD, Department of Surgery, Ospedale di Rimini, AUSL Romagna. , Gianluca Garulli MD, Department of Surgery, Ospedale di Riccione, AUSL Romagna. , Michele Genna MD, Department of Surgery, Policlinico Abano Terme, (PD). Raffaele Gianesini, Department of Surgery, Ospedale San Lorenzo, Valdagno (VI), Aldo Gioffrè MD, Department of Surgery, Ospedale San Filippo Neri, Roma. Mario Guerrieri MD, Department of Surgery, University Hospital, Ancona. Marco Azzola Guicciardi MD, Department of Surgery, Ospedale di Cantù, Como. Elio Jovine MD, Department of Surgery, Ospedale Maggiore, Bologna. Ernesto Laterza MD, Department of Surgery, Ospedale Mater Salutis, Legnago (VE). Stefano Merigliano MD, Department of Surgery, University Hospital, Padova. Marco Milone MD, Department of Surgery, University of Napoli, Napoli. Gianluigi Moretto MD, Department of Surgery, Ospedale Pederzoli, Peschiera del Garda (VE)., Emilio Morpurgo MD, Department of Surgery, Ospedale Camposampiero, Camposampiero (PD). Giuseppe Navarra MD, Department of Surgery, University Hospital, Messina. Vincenzo Neri MD, Department of Surgery, University Hospital, Foggia., Roberto Ottonello MD, Department of Surgery, Ospedale San Marcellino, Muravera (CA). Vincenzo Panebianco MD, Department of Surgery, Ospedale di Taormina, (ME). Maurizio Pavanello MD, Department of Surgery, Ospedale Castelfranco Veneto, Treviso. Eraldo Personnettaz, Department of Surgery, Presidio Ospedaliero di Ciriè, ASL TO 4, Ciriè (TO). Miacela Piccoli MD, Department of Surgery, Ospedale Civile Sant’Agostino Estense, Modena. Fabio Priosa MD, Department of Surgery, A.S.O. SS. Antonio e Biagio e C. Arrigo, Alessandria. Aldo Rossi MD, Department of Surgery, AOU Policlinico di Modena., Mario Sorrentino MD, Ospedali di Latisana-Palmanova, Gorizia. Umberto Tedeschi MD, Department of Surgery, AOUI Verona. Silvio Testa MD, Department of Surgery, Ospedale S. Andrea, Vercelli. Augusto Verzelli MD, Department of Surgery, Ospedale E. Profili, Fabriano (AN), Nereo Vettoretto MD, Department of Surgery, Ospedale di Montichiari, ASST Spedali Civili di Brescia, Montichiari (BS). Vincenzo Violi MD, Department of Surgery, University Hospital, Parma. Pier Sante Zattini MD, Department of Surgery, Ospedale di Lugo, Lugo (RA). The study protocol has been approved by the institute’s committee on human research. Subjects involved in the study have given their informed consent.